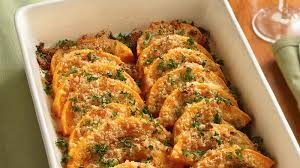 Crispy bread crumbs add a bit of crunch to tender slices of butternut squash seasoned with garlic and Parmesan. 1 Heat oven to 375°F. Spray 13×9-inch (3-quart) glass baking dish with cooking spray. Peel, halve lengthwise and seed squash; cut into 1/2-inch-thick slices. Arrange with slices overlapping slightly in bottom of baking dish. 2 In 2-quart saucepan, melt butter over medium heat. Reduce heat to low. Add garlic; cook 2 to 3 minutes, stirring frequently, until garlic is soft and butter is infused with garlic flavor. Do not let butter brown. 3 In small bowl, mix bread crumbs, cheese and 1 tablespoon of the butter-garlic mixture. 4 Brush squash slices with remaining butter-garlic mixture. Sprinkle with salt, pepper and bread crumb mixture. 5 Bake uncovered 30 to 40 minutes or until squash is tender when pierced with fork. Increase oven temperature to 425°F; bake 5 to 10 minutes longer or until lightly browned. Before serving, sprinkle parsley over top. Melt butter in large saucepan over medium heat. Add onions, thyme sprigs, and 1/2 teaspoon salt, stirring to mix. Cover and reduce heat to low. Cook, stirring occasionally, until dark golden brown, about 45 minutes. Remove thyme stems. Meanwhile, preheat oven to 450° F. Toss butternut squash with olive oil and 1/2 teaspoon salt and spread out on baking sheet. Bake until browned and very soft, stirring once, about 40 minutes. Reduce oven heat to 350° F. Roll dough out until thin and press into a well-greased 10-inch tart pan. Prick all over with a fork and bake in oven 10 minutes. In a medium mixing bowl, combine eggs, crème fraîche, gruyère, Parmesan, and black pepper. 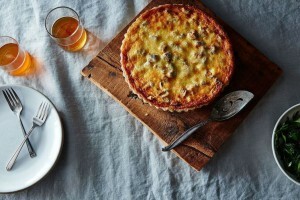 Spread caramelized onions in bottom of tart and top with butternut squash. Pour gruyère mixture over the squash, making sure to spread it evenly throughout the tart. Bake until golden brown and cooked through, about 30 to 40 minutes. Cut butter into 1-tablespoon pieces and freeze for 10 minutes. Mix flour and salt in food processor or large bowl. If using food processor, add butter and mix until mixture resembles small pea-sized balls. If mixing by hand, work quickly, mixing the butter in with your hands until it forms small pea-sized balls. Add in ice water and mix just until dough forms and comes together. Form into disk, wrap in plastic, and place in fridge for 20 minutes. Position racks in the upper and lower thirds of the oven; preheat to 425 degrees. Have two rimmed baking sheets at hand. Cut the squash in half lengthwise. Discard the seeds, then cut the flesh into wedges 3/4 inch wide and about 2 3/4 inches long, leaving the skin on. Place in a large bowl with the cinnamon, 2 tablespoons of the oil, 3/4 teaspoon of salt and a good grind of pepper. Mix well so that the squash is evenly coated. Place the squash pieces on the baking sheets skin side down and roast for 35 to 40 minutes, until soft and starting to color on top. Remove from the oven and set aside to cool. 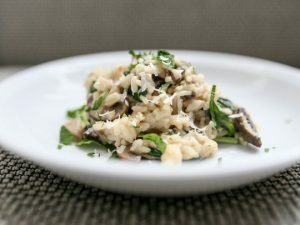 To make the herb paste, combine the cilantro, garlic, the remaining 4 tablespoons of oil and a generous pinch of salt in a mini food processor; puree to form a smooth paste. Reduce the oven temperature to 350 degrees. Spread the pumpkin seeds on a baking sheet and roast for 6 to 8 minutes. Their outer skins will pop open, and the seeds will become light and crispy. Let them cool. To serve, swirl together the yogurt and Sriracha sauce. 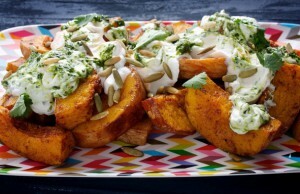 Lay the squash wedges on a platter and drizzle the spicy yogurt sauce, then the herb paste, over the top. (Or swirl the yogurt sauce and herb paste together if you like.) Scatter the pumpkin seeds on top, followed by the extra cilantro leaves and additional Sriracha, if desired, and serve.